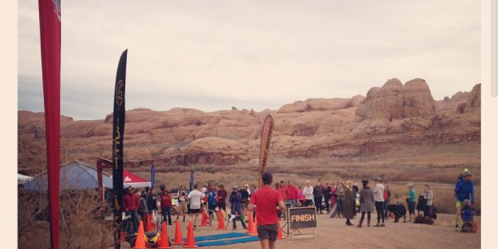 In the months leading up to the race, the term slickrock conjured up images of trail-running beauty. I had imagined myself gracefully gliding over said terrain, months of hard training paying off in the form of a confidence-building, high-placing finish time. I had not pictured myself slapping my feet down on uneven, unforgiving terrain, blistered and battered and crossing the finish line significantly slower than expected. Such is trail-running. I had never been to Moab prior to last weekend and was excited to check it out. Big name athletes like climber Steph Davis and iRunFar‘s Bryon Powell called the town home, how could I not love it? Meeting Bryon was a highlight of the trip as he was super nice and friendly, even though I bothered him right after he finished the 33k in a damn good time. I actually did see Steph at a breakfast place the day after the race, but was way too nervous to talk to her. Driving in, the land around Moab was undeniably pretty (aside from the garish “Hole in the Rock” tourist trap business on the way into town from the east). We stopped at Eddie McStiffs, the long-standing Moab restaurant, for packet pickup. My weekend of “celebrity” sightings began as we lined up directly behind Jenn Shelton. She was standing alone and, were I less shy, it would’ve been a great time to say hey. I chickened out and we proceeded through the packet pick-up line. The beer nerd that I am, my wife and I then decided to check out Moab Brewery for dinner. I had either forgotten or blocked out the fact that most of my beer selection while in town would be of the 4% ABV variety. Hard truths about Utah only continued on the next morning. We arrived at the start of the race fairly early and walked the mile or so of jeep road to the starting area. I was in full ultra-running nerd mode, pointing out the big names I saw; Karl Meltzer, Geoff Roes, Joe Grant, Anton Krupicka, Bryon Powell, Darcy Africa, Zeke Tiernan, Jenn Shelton, etc. The 55k race started a half hour before my own, so I got to watch the start and see the same long, gradual climb that I would be taking. A half hour later, the 33k racers began to queue up. I had planned to stand near the middle of the pack, to hopefully avoid some of the bottleneck that I witnessed at the start of the 55k. Somehow, I actually ended up at nearly the front of the starting line, near much faster runners. The starting countdown commenced and we headed off down the jeep road, and up around to start the first initial climb. Buzz Burrell was there snapping pictures, probably happy to see the huge amount of Ultimate Direction packs throughout the field. The first climb was fairly moderate and enjoyable and I tried to stay in a very low gear, despite the adrenaline of finally starting my 2014 race season. I felt like the entire field was passing me in the first two or three miles, but I contented myself with the fact that the pace was feeling very easy for me and that I would make it up in the second half of the race. The initial third of the race was really enjoyable. I felt extremely in control and the pace felt very easy. I was running any short inclines and power-hiking anything substantial. I felt great throughout the day on the climbs, routinely passing other racers with my power-hiking, including some who were running up the climbs. 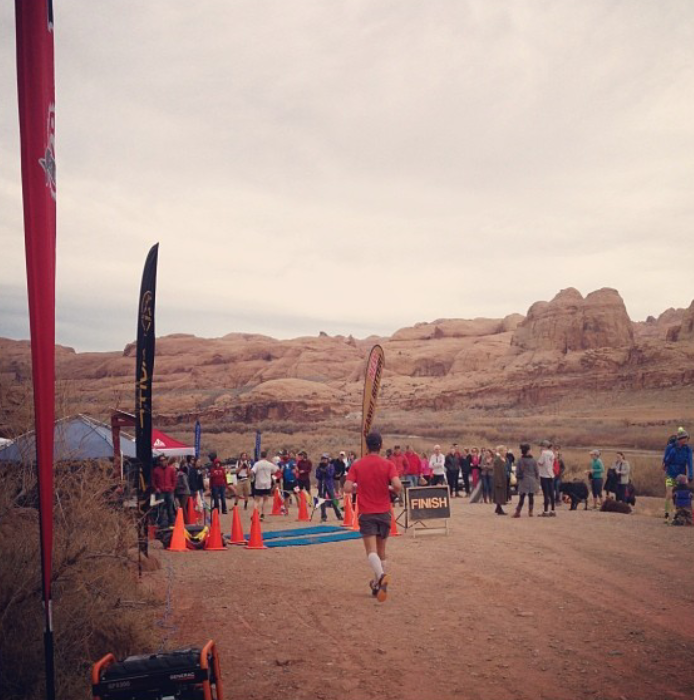 Near the middle third of the race, the course changed from the soft Jeep roads to the Moab slickrock I had heard so much about it. It was absolutely brutal. My problems began almost immediately at that point. Other than on the climbs, where I was still strong, I felt awkward and slow. My New Balance MT110s, shoes I have never had a problem with, left my feet feeling unprotected. My feet slid around the uneven trail, almost immediately resulting in an extremely painful big toe blister, another problem I very rarely have. Throughout the rest of the race I could never seem to find the optimal stride or maintain a solid pace. My back kept seizing up from the uncomfortable slickrock pounding and the blister on my toe shot with pain on nearly every stride. I almost instantly became so distracted that I started forgetting to take calories, resulting in a massive bonk soon after. The entire second half of the race was just an exercise in enduring pain, certainly not the worst lesson to learn for the upcoming ultrarunning season. I finished in 3:20:53, a pace of nearly a minute per mile slower than I had hoped. As always, there were positives amongst the negatives of the race. I felt stronger than anyone near me during nearly every climb. Clearly my specificity in vert training is paying some dividends. I also never really felt like my endurance was the problem, just the pain from pounding over miles of rock on light shoes. Constructively criticizing my race is fairly easy. I didn’t know enough about or prepare enough for the specific terrain of the course. Despite my love for them, the New Balance MT110s were absolutely the wrong shoes for the course. If this had been an A-race for me, I would’ve spent significantly more miles on pavement to simulate some of the pounding of the slickrock. Taking in calories was again a problem. I have to learn to make it a priority regardless of whatever level of pain I’m experiencing. I sped through the aid stations, proud of myself for passing people dawdling at each one. But instead of only stopping long enough to top off my water bottle, I should’ve downed calories at each and taken in some salt since I neglected to bring any tablets with me. Overall, it was an enjoyable weekend and great to visit a new locale. Positive takeaways and growth opportunities both made themselves apparent and I can start dialing in my training even more.